the Member List contains the correct payroll and payroll reference information. 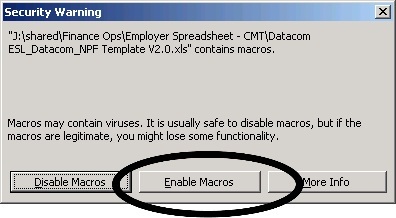 If a security warning appears, select the “Enable Macros” button. The spreadsheet should open on the Contribution Data worksheet. If the Contribution Data worksheet is displayed, your macro security settings are correct, and the Contribution Management Tool will operate correctly. If the Welcome worksheet is displayed, your macro security settings are set too high. Follow the instructions on the Welcome page to set your macro security to a level that will allow the Contributions Management Tool to operate correctly. The Member List is the core database of the excel template. This list must be correctly maintained for the template to populate the correct data when you submit a new contribution batch. When you receive your copy of the Contributions Management Tool, the Member List will contain a list of all employees currently enrolled in your National Provident Fund employer superannuation scheme(s). 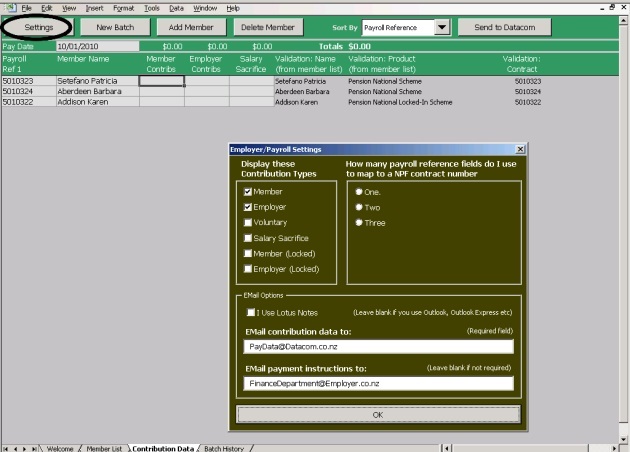 The Payroll Reference field 1 is pre-populated with the correct contract number for each employee. This contract number can be retained as your primary Payroll Reference field if it is a field in the payroll data that you will use. If not it should be replaced with the Payroll Reference that you use to identify each employee. 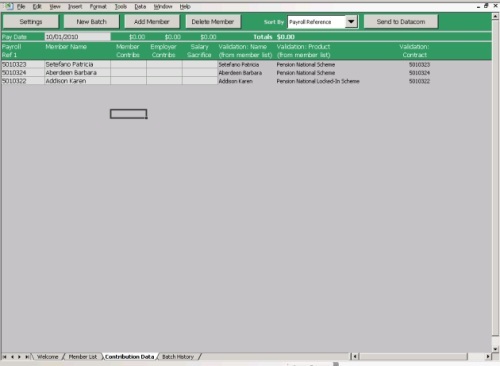 The spreadsheet uses the payroll reference fields to validate each contribution listed on a payroll batch. It is important that the numbers referenced here match the employee reference codes used by your current payroll system. 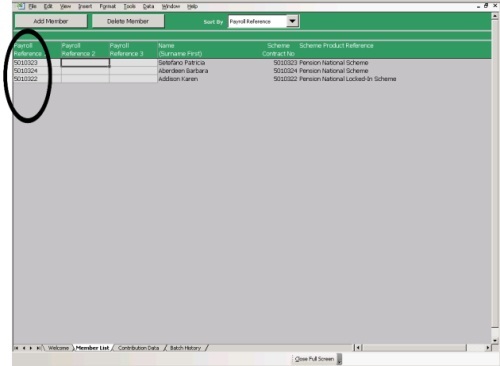 There are three payroll reference fields available that you can populate with payroll system data that will map to the unique scheme contract number. Follow the instructions below to update the Member List. Click on the Member List tab to open the correct worksheet. up to three payroll references may be entered per line of the Member List (e.g. payroll number, employee number, IRD number). Refer to:"Submitting Contribution Data" for information about completing payment details, and how to add a member or delete a member from the Member List. specify an internal email address to forward the contributions data to, once a contributions batch has been submitted. Click on the Contributions Data tab. 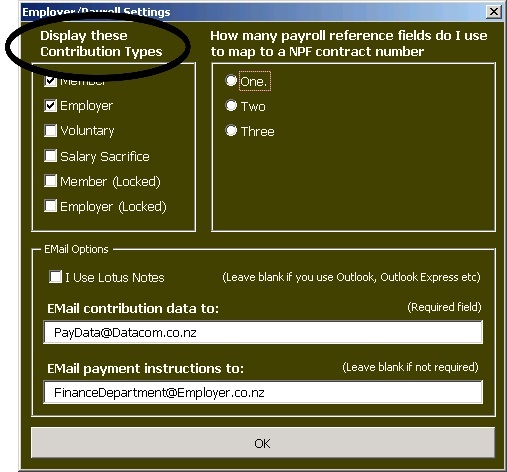 Click the ‘Settings’ button at the top of the worksheet to access the ‘Employer/Payroll Settings’ menu. Ensure that the checkboxes are ticked for all contribution types that apply to your payroll and un-tick any contribution types that do not apply. 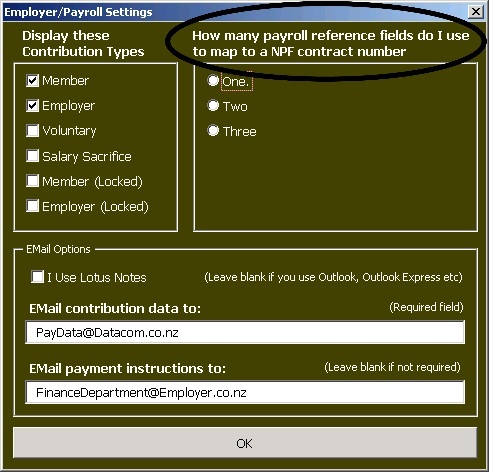 Select the number of payroll reference fields you wish to display/use to identify your employees. If the details of the superannuation contributions need to be sent to another department or staff member within your organisation, enter the email address the ‘Email payment instructions to:’ field. Click ‘OK’ to save the settings, and return to the Contribution Data worksheet. Note:These settings can be adjusted at any time by returning to the ‘Employer/ Payroll Settings’ menu, via the Contributions Data worksheet.